The political standoff between Kuwait's royal family and some members of parliament has delayed health, education, investment and infrastructure projects. Al Jazeera correspondent Hashem Ahelbarra explains the issues fuelling the feud. Q: Why has the Kuwaiti parliament been dissolved three times in as many years? Kuwait faces the challenge of maintaining a relatively democratic system while preserving quasi-absolute powers of the ruling family. More videos...The media is very outspoken, MPs have more latitude to file no-confidence votes, sanction the government and fire ministers. However, criticising Sheikh Sabah al-Ahmad Al-Sabah, the emir, or ruler, of Kuwait, is a red line. Attempts by independent and Islamist members of parliament to oust the prime minister and the defence minister - both of whom are members of the royal family - were rebuffed by the emir, who simply dissolved the legislature to put an end to the political standoff that has crippled life in the oil-rich Gulf state. MPs who openly said that some members of the royal family are unfit to hold key cabinet posts, were also arrested and accused of disparaging the powers of the emir. Mutual distrust between the national assembly and the ruling family has deepened over the past few years, with both sides trading accusations. The royal family alleges some MPs have abused their constitutional powers for personal gain. On the other hand, parliamentarians say the government is not up to the task of ruling the country. Is the political crisis rooted in a standoff between what some describe as 'Islamist deputies' and a pro-Western government? Not exactly. There is a misconception here. 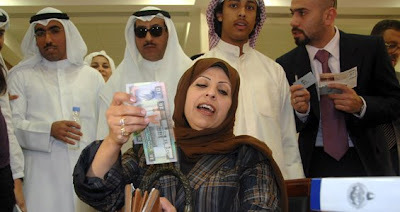 Unlike in Egypt, the "Islamists" of the Gulf in general, and of Kuwait in particular, have on many occasions sided with the government and approved legislation and budgets. Rather, the standoff is between conservative Islamic, independent, liberal and tribal MPs who think the powers given to the ruling family - particularly the emir and the prime minister - should be diminished. The row that prompted the emir to dissolve the parliament came after the latter accused the royal family of squandering public funds and doing less to bail out the economy. However, it is important to remember the crisis is not just rooted in dissatisfaction with a government. It is more about a parliament asking to have a bigger say in the decision-making process - something that the conservative Gulf state is not ready for just yet. Why won't the prime minister - a relative of Sheikh Sabah - stand down? The crisis started when some MPs tried to question Sheikh Nasser Mohammed al-Ahmad Al-Sabah - nephew of the emir - for allegedly misusing public funds and mismanaging the country. But the spat was not only about his personal performance; it was more about the role of the prime minister and the powers he exercises. In 2003, in a departure from long-established tradition, Jaber al-Ahmad Al-Sabah, the then emir, removed the title of prime minister from the crown prince. Separating the two positions was a key demand of political reformers in the country. But just a few years on, securing the premiership is the dream of many ambitious members of the ruling family because the prime minister will most likely become a crown prince if the emir dies. This is the reason why prime ministers now desperately fight to remain in position and the importance of the role has created tensions within the royal family. Observers suspect some sheikhs may be using their allies in parliament to topple the prime minister for their own interests. What sort of political system is in operation in Kuwait? Kuwait is a constitutional monarchy with the oldest parliament in the region. The emir still holds huge powers, but the parliament has the means to influence many decisions. The constitution gives the assembly the right to dismiss the prime minister or any other cabinet member - although it must follow a series of procedures. The nomination of the emir and the crown prince has to be approved by the legislature. However, relations between the royal family and parliament have been constantly tumultuous. The Kuwaiti sheikhs blame MPs for trying to win rights that have been royal perogatives for decades, while independent MPs want parliament to have a bigger say in political life. Parliament has been suspended entirely on three occasions in the past - from 1976 to 1981, from 1986 to 1991 and from May to July 1999 - when the dispute reached absolute deadlock. Women can stand for election so why aren't there any female MPs? Despite the fact Kuwait has more political freedoms, a social context that allows women more opportunities compared to, for example, Saudi Arabia, women only won the right to vote and run for public office in 2005. Women have been trying hard to secure a seat in parliament, but gender barriers are still deeply rooted in Kuwaiti society. The chances of a woman being elected to the legislative body remain slim because of the lack of political support. Ironically, even though polls suggest women make up more than 50 per cent of the electorate, female candidates received more votes from men than women. For women to successfully stand for election, they need to win the female vote. What are the financial implications for Kuwait given the current political impass is holding up legislation - including passing a financial stimulus package? The political stagnation is claiming victims in the country - projects have been postponed and many social development programmes have been delayed. Although it enjoys massive oil reserves, Kuwait is lagging far behind neighbouring countries in terms of healthcare, education and infrastructure - again, largely because of the bickering between the cabinet and parliamentarians. Have companies began to pull out of Kuwait? However, the oil-rich nation will continue to attract more companies vying for lucrative contracts.